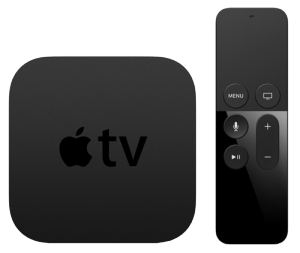 In 2015 Apple again launched its new Apple TV Fourth Generation model. It includes the A8 processor. This is a big step up from the older version A5 processor. It has a Siri enabled remote control and with the new App Store for third-party applications it had to reconsider and change its interface a bit as well. 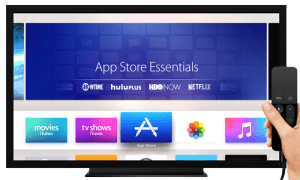 With the older versions of Apple TV when you opened it up you would have seen many app squares, or channels, that took up the entire screen, and many of these apps most people did not use. Now you have to go to the App Store and choose to download the applications that you want to your avail. This gives you a much better hold on giving your own personal feel and layout to your selection screen. Now there over a thousand apps on the tvOS App Store to choose from. In order to add your apps you need to know what you’re looking for and also enter your iCloud password. 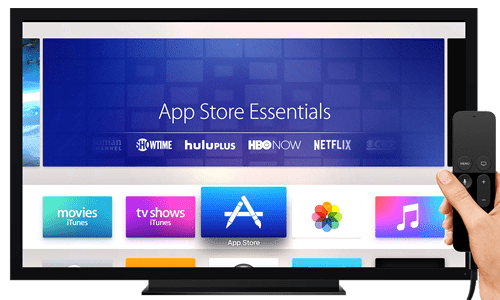 On the older versions of the Apple TV the top row of the selection screen was reserved for Apple’s own apps and there was no moving those around. Now, you can place apps wherever you please, to include the ones you mostly use for the top row position. 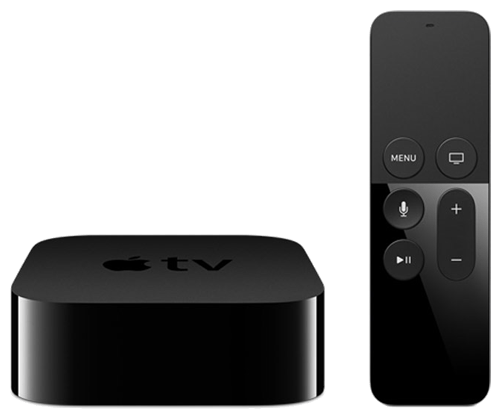 The Siri remote is a huge upgrade, from the older model. Now you can use the remote to control your TV volume using the Apple Remote and providing that your TV is up to date and supports HDMI-CEC, and if you have a newer TV it has that capability. 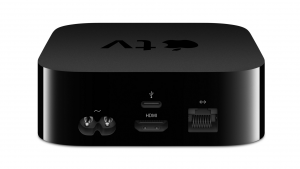 If your TV supports this standard, and more than likely it does, you’ll be able to not only adjust your TV’s volume but you will also be able to turn it on and off, and to turn on your TV you only need to wake up the Apple TV itself. This means that you can now turn on your TV and not have to switch the input drive to HDMI on your TV’s source options. With Siri you can now vocally command it to “skip forward ten seconds”, “pause”, and you can ask it, “what did he [actor] just say?” These are some pretty cool features but only limited to a few countries (as of this writing), but Apple is continually working on the voice recognition to expand this awesome function. The battery in the remote is reported to last a few months on a single charge, and is charged by using a Lightning Cable or from a USB port on our Mac, and of course you can use the power adaptor that came with your iOS device, and it only takes a couple hours for a complete 100% charge. The 4G Apple TV didn’t support the Apple Remote app prior to upgrading to the newest version of 4.2.3. Unfortunately, Apple seems to have planned to drive you nuts with the way you need to use the search term or password entry. The onscreen keyboard is no longer a grid layout; instead, the alphabet is laid out in one line, with capital letters, lowercase letters and numbers all on separate pages/screens, and the amount of back and forth left-right swiping is tiresome and unbecoming of Apple’s general designing. Apple did however make a few shortcuts on the onscreen keyboard. 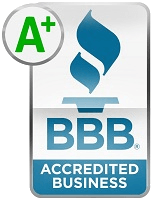 For example, you can press and hold a lowercase letter to make it change to capital letter, and you can enter frequently used phrases rather quickly as well, however, it is a very frustrating set-up. Luckily, one saving grace about this is that via Bluetooth you can easily link a wireless keyboard to the system, and with the integration of Siri you should be able to search what would be typed searches. If you were hoping to have access to other controllers for gaming, you’ll be disappointed to know that it can only support 2 Bluetooth controllers at a time. 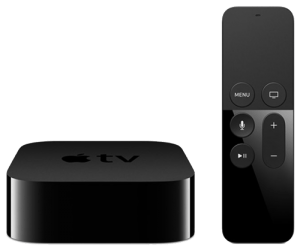 You can also only use one Siri Remote per Apple TV, so multiplayer gaming that which requires two Siri Remotes is impossible and you will have to find other alternative remotes online for purchase. The Siri Remote is light and awkward to use and the trackpad is just way too small to be useful, and thus, most will be looking to purchase joysticks for gaming. The Apple V is based on the tvOS operating system and like all iOS and MAc OS systems it can be updated for free whenever Apple releases the free updates. While expectations were high for the new release, it left customers wanting for a more user-friendly experience, but for most of the issues there seems to be an easy way to rectify them. Hough it’s still not perfect, there is a ton of potential that isn’t being utilized currently, but as updates continue to swell in, inevitably most of the complaints will be null.